As a member of a relatively small team, I find myself constantly working against the clock. Particularly in the case of creative projects, there just seems to never be enough time to do all the things I’d like to do. In this week’s post, I will discuss how to inspire and nurture creativity in your office. And he or she may be right! Maybe the idea is a big, stupid, risky fad, and you probably don’t have the resources to devote to it right now. But you must ask yourself how important this truly is. Do your research. If it is something that you really feel is worthwhile, you may need to take a risk and work on it. This may require unpaid overtime or working from home, but if this is something you actually believe in, that kind of thing typically doesn’t make a difference. I have found that the term “creatives” often has a negative connotation attached to it. This is for a few reasons. The first is the media. Television shows or feature films that glorify and glamorize the work of designers or artists often mislead the non-creative public. The second is because of what I like to call the “self-appointed creative.” This term applies to a person who calls himself or herself a “creative” out of convenience, or uses the label as an excuse. Here is an example. Let’s say you’ve contracted a freelance designer named Betty-Lou. Betty-Lou seems to fit the typical creative profile with black plastic glasses, a Starbucks cup in hand, and remnants of her last art project under her nails. So, to the unknowing business person, Betty-Lou seems a perfect match for an upcoming web design project. However, the business owner soon finds Betty-Lou missing deadlines and turning in sub-par work. Betty-Lou explains that this is all part of her “creative process” and that this sort of thing takes time. The business owner, who simply doesn’t know any better, accepts this as fact – assuming that this is how all creative people work. I’ve got news for you. This is not how creative people work. True creative people have no trouble backing up there ideas, following though, and meeting deadlines. They don’t use their creativity as some sort of get-out-of-jail-free card when they oversleep or forget a major deliverable on a project. They think critically and get the job done, no excuses. Bearing that in mind, you must be careful whom you choose to represent your creative team because they should be a part of nearly all client-related decisions. Don’t assume that a task is too large or too small for a creative person to handle, or at least contribute to. Without creative people, we wouldn’t have many of the outstanding products, companies or organizations that we are familiar with today. 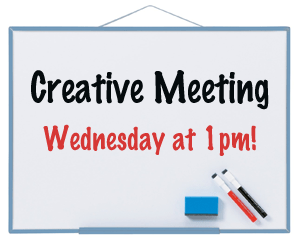 Here at Optimum7, I ask the team to gather at 1:00pm on Wednesdays for our weekly creative meeting. During this meeting we discuss new ideas to pitch to our clients, and provide updates on all creative projects in progress. I find that scheduling the meetings at the same time on the same day each week provides just the right amount of consistency and structure. In addition, it allows members of the team ample time to prepare. In addition to designating a time for creativity, it is important to designate a space for these creative meetings. Our creative space is on the second floor of our office. We have a large board-room-style table and an enormous whiteboard hung on the wall. On this whiteboard, we keep track of all new ideas and projects in progress. By using the whiteboard instead of printing out agendas, each member of the team can easily see where we stand with our ideas at any given moment. And of course, it doesn’t hurt to save a little paper! In addition to our whiteboard, I also post a recap of each creative meeting on a specific thread in our project management system. This allows everyone, present at the meeting or not, to take part in the creative process and stay up-to-date on the progress being made. So what does this mean? It means that you shouldn’t be fooled by the more vocal members of your team. I personally think of these team members as bulldozers. From high school group projects to your current work environment, I’m sure you’ve experienced this type of personality. Let me just say here, that not all outspoken people are bad. I actually tend to be a bit extroverted myself. But I do not consider myself a bulldozer. A bulldozer interrupts other team members mid-sentence or dismisses their ideas with a wave of their hand. What a bulldozer doesn’t realize, however, is the amount of damage he or she has done to the remaining, more introverted members of the team. You see, it takes much more courage and energy for an introvert to make a comment during a meeting than it does for an extrovert. As such, an introvert is often much more offended when interrupted or dismissed than an extrovert. So how do we fix this? Obviously, we can’t convert all the extroverts to “introvert-ism” or visa versa. What we need to do is treat everyone equally, but not the same. Extroverts need to learn to be more respectful and tame the temptation to interject. And introverts must learn to be more comfortable with their team, and confident in their ideas. This can only happen with the use of a mediator. A mediator’s job is to keep the team on track, and make sure everyone’s ideas are heard and, more importantly, respected. At your next meeting pay attention not only to the ideas your team puts forth, but also how they are presented and received. Do you remember the days when offices shunned social media networks and forbade their employees from taking part in such networks on company property? Many of those companies (marketing companies in particular) have rejected this notion and begun encouraging the use of social media for authority building and research processes. Allow your employees to use social media in productive ways and you will be rewarded. Everyone goes through dry spells – call it designers-block, writers-block, artists-block, etc. One of the best ways to get past this creativity drought is to break out of your routine and do a little research. This can involve reading an article from your favorite blog, taking a quick walk, checking out your Twitter feed, or listening to some new music. No matter what you do, make sure it has nothing to do with the task at hand. By getting out of your comfort zone and taking your mind off of the project you’re currently working on, you allow yourself to relax and accept new ideas. In Why Productive People Have Empty Schedules by Drake Baer of Fast Company, Warren Buffett discusses the need to control your time by refusing to say yes to every opportunity. As a card-carrying yes-girl, I find it difficult to adopt this practice. I say yes to every opportunity, task, or invitation that comes my way. Often, I’m left overworked, sleep-deprived, and stressed. The worst part about it? I do it to myself. By refusing to say no, I am stuck with too much to do and not enough time to do it. This is a process that I definitely need to work on, because by saying “no” more, I will be able to more efficiently contribute to other projects that I’m already working on. As I mentioned in the beginning of this post, time is a fleet resource of which we will almost never have enough. It is almost impossible to get everything you’d like to accomplish done at the same time. You must sit down (perhaps during creative meetings, like we do at Optimum7) and discuss what projects are both worthwhile and practical. From there, you can delegate the work among the team to get it done more efficiently. When one set of tasks is completed, move on to the next one. It may be a somewhat slow process, but it needs to happen. Stop saying that you won’t be able to take on projects because you don’t have time. You will never have time. Work little by little toward your goals, so in five years you won’t be in the same place wishing you’d started five years ago..
Creativity is a risky, time-consuming part of our work here at Optimum7. However, with the right people, creative projects can be prioritized, structured, and carried out in an efficient manner. Looking for a marketing company that isn’t afraid of a little creative thinking? Contact Optimum7 for a free consultation.